The Blauer Saal has a cozy restaurant atmosphere. 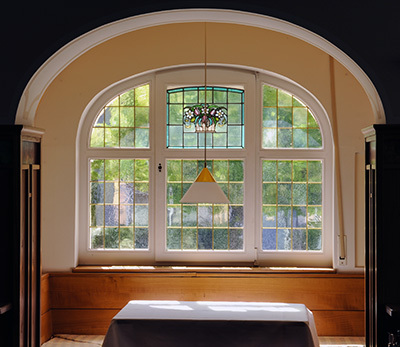 Small alcoves along the sides and the arched window façade with colorful glass make up the charm of this room. In combination with the Restaurant adjoining this hall, you can celebrate with up to 90 people here. The rooms are joined by large winged doors. When opened, these two rooms create one large, spacious hall. However, smaller celebrations starting with 30 people are also well-accommodated in the Blauer Saal. The Blauer Saal has a direct access to the Saalplatz (public square) outside. In the summer, this quick access outdoors is perfect for a sunny champagne reception in front of the Blauer Saal.